Transformational piano composition to help release pain and anger. Powerful, angry, chaotic and unrelenting energy gives way to nurturing, loving and liberating energy. The resolution may be experienced in the listener, physically or emotionally. Cancer: Touching Deep With Music , from Sound Feelings, is a downloadable .mp3 or FLAC intended as adjunctive, supportive entrainment cancer music to encourage emotional expression, which complements natural healing, cancer treatments, anger release (EVEN IF YOU DON’T HAVE CANCER! ), cancer therapies, cancer remedies and cancer cures. Appropriate for cancer research and any natural medicine program. The listener should be process-oriented rather than goal-oriented to appreciate this music for cancer. 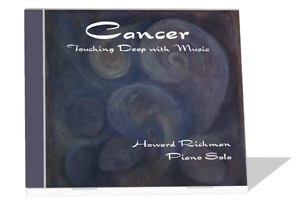 Cancer: Touching Deep With Music. Music has the distinct quality of being able to touch both the emotional and the physical parts of our being. Each person will respond differently to the Cancer/Anger music. Some people will experience more of an emotional response and others will experience more of a physical response. It has been shown that there is a “mind-body link” between the emotional and physical. This means that certain emotional states are associated with certain physical conditions. Cancer has been found to be associated with suppressed anger. If the emotional pain is reduced, it could be indirectly helpful for the physical condition. Similarly, if the physical condition is improved, it could be indirectly helpful for the emotional state. See the Uses and Applications for Cancer. Available INSTANTLY. After you make your payment, you will be given a password which will allow you to download the .mp3 or FLAC version of Cancer. You will then be able to hear the complete track on your computer. If you prefer, you may use your CD burner on your computer to burn a CD of the track, which you then will be able to play on any CD player. Did you know that you absorb more chlorine from taking a shower than by drinking tap water? Did you know that chlorine is incredibly toxic to the human body and has been linked to many illnesses, including cancer, cardiovascular disease and allergies. This is the BEST shower filter you can get! Recently voted Product Of The Year by Cosmetology Today Magazine. Aquasana AQ-4100 Shower Filters have 2 separate filter stages. One that takes out ALL the chlorine and balances the pH, the other filters out harmful VOCs that vaporize while showering and are unhealthful to inhale. Its like showering in natural spring water. Softer skin and hair in 1 week, guaranteed! It also filters out parasites such as Campylobacter, Giardia and Cryptosporidia and others.cleansing. five free tips to help release anger. Colon Cleansing Alternative to Enemas and Laxatives. Also, please see our links to other helpful sites about cancer, anger release and sound healing.